These are a few of the quilts from our book, Amish-Inspired Quilts, which is available in print-on-demad and eBook formats. Click here to find it at pieceocake.com. Lorna’s Vine, below, is available as an individual epattern. Click here for more information. Lorna’s Vine from the book Amish-Inspired Quilts by Becky Goldsmith & Linda Jenkins. Quilt by Becky Goldsmith. Amish Baskets from the book Amish-Inspired Quilts by Becky Goldsmith & Linda Jenkins. Quilt by Linda Jenkins. Quilt Fragments from the book Amish-Inspired Quilts by Becky Goldsmith & Linda Jenkins. Quilt by Becky Goldsmith. Feathers from the book Amish-Inspired Quilts by Becky Goldsmith & Linda Jenkins. Quilt by Linda Jenkins. Triple Irish Chain from the book Amish-Inspired Quilts by Becky Goldsmith & Linda Jenkins. Quilt by Becky Goldsmith. Becky the quilts are gorgeous ! Based on what i have read on your blog I thought I would recommend this book to you http://www.amazon.com/The-Cuckoos-Egg-Tracking-Espionage/dp/1416507787 You can get the book or read the pdf online if you can. http://vasilius.com/ebook/cuckoo_egg.pdf Either way it is a very funny well written book on the Hanover hacker if you have a sys analyst hubby like I do you know what I mean . Anyhow this man who wrote the book is extra ordinary , he is a physicist an astronomer who tries to catch a hacker while helping his lawyer wife to piece quilts in between for fun hahaha !!! You will enjoy it I think ! Amish quilts were the reason that I began making quilts in 1976! They are close to my heart! I try hard to like PDF-like books. I enjoy fiction and non-fiction through the Kindle App, but for some reason when it comes to quilt, sewing and other “how-to” books I just “have to have” a hard copy! Thanks for the chance…. and ps…I subscribe to your blog by email and the links to this article did not work for me….but the URL link got me here just fine…. Yeah, the post went up 5 days early. Deep sigh on my part. I’ve reset it to go again really on Wednesday. Your comment will still be there. I hate confusing people but there you go. I am probably confusing people :-). Wow! Those are beautiful quilts and the quilting on them is gorgeous. Looks like I’ll have to add another book to my collection. I have always loved Amish quilts with the beautiful quilting and this book takes their quilts to a new level. Love it. I love the idea of “modernizing” traditional and Amish designs! Thanks four sharing. As always I love you use of color and whimsy. Truly beautiful and bold quilts! I would love to add this book to my collection, and create several projects – beginning with Feathers. Beautiful quilts, what an opportunity to challenge myself to try colors a new way. Thank you for showing them. Such beautiful quilts. I love the bold colors. Still working on you Hexi quilt. Just love doing it. Will send pictures when further along. Glad that Lorna has caught the quilting bug. Another convert is always good for the clan. Growing up near Amish country, they were always inspiring. Also learning about the Amish people was interesting. More later. When I was younger I always wanted to do the things the Amish way, from canning, quilting and their way of life. I still admire their living helping each other always. 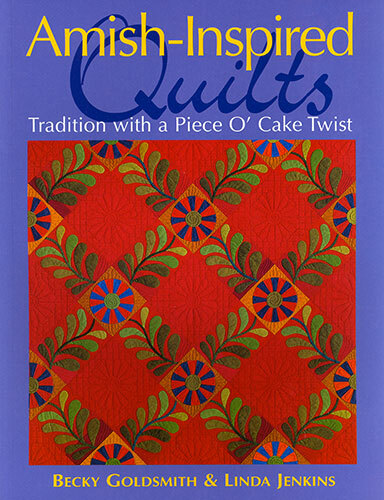 I would really enjoy this quilting book and learning even more about the Amish. I can’t believe I don’t have this book. I have almost every book that you have done as I love how cheerful they make me feel! I’ve always had an interest in Amish quilts and Amish inspired quilt patterns. I actually made an Amish inspired basket quilt for my daughter’s graduation from high school (many years ago now). So, therefore, I have quilt a small library of books about Amish quilts and Amish quilt patterns but alas, I do now have this one and would truly love to add it to my small, but hopefully growing (by at least one) library. Love these quilts. The borders focus on Amish designs. I love all the Amish colors.